[Mystery fiction] is often used as a synonym for detective fiction or crime fiction—in other words a novel or short story in which a detective (either professional or amateur) investigates and solves a crime mystery. The term "mystery fiction" may sometimes be limited to the subset of detective stories in which the emphasis is on the puzzle/suspense element and its logical solution, as a contrast to hardboiled detective stories, which focus on action and gritty realism.— Excerpted from Mystery fiction on Wikipedia, the free encyclopedia. The Woman in White, 1860 by William Wilkie Collins, one of the first mystery novels. Uncle Silas, 1865 by Sheridan Le Fanu, an early example of a locked room mystery. The Moonstone, 1868 by William Wilkie Collins, considered to be the first Detective novel in the English language (Poe's The Murders in the Rue Morgue, as a short story, being the first piece of Detective fiction in the English language). The Mystery of the Yellow Room aka Le mystère de la chambre jaune, 1907 by Gaston Leroux, another early example of a locked room mystery. Trent's Last Case aka The Woman in Black, 1913 by Edmund Clerihew Bentley, the first major send-up of the Detective genre. Listed alphabetically by character name. The Murders in the Rue Morgue is regarded as the first English-language Detective story. 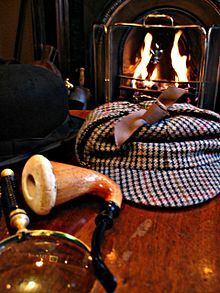 Phototgraph of a collection of items related to Sherlock Holmes resting on a table in front of a fireplace: a Meerschaum pipe, a deerstalker hat, a bowler hat and a magnifying glass. Novels are listed in bold. NOTE: The Casebook of Sherlock Holmes is not entirely in the public domain in the United States. Most of the following links go to Bibliowiki, which is based in Canada. This page was last edited on 24 January 2018, at 12:29.